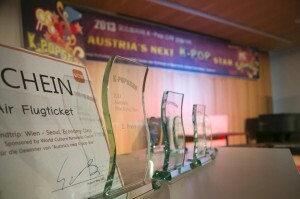 [en] The Final of Austria’s Next K-Pop Star (ANKPS) – Part 3: Austria’s Next K-Pop Star and the awesome prizes! Please note that this article reflects the author’s opinions and not necessarily those of kpopeurope.eu! 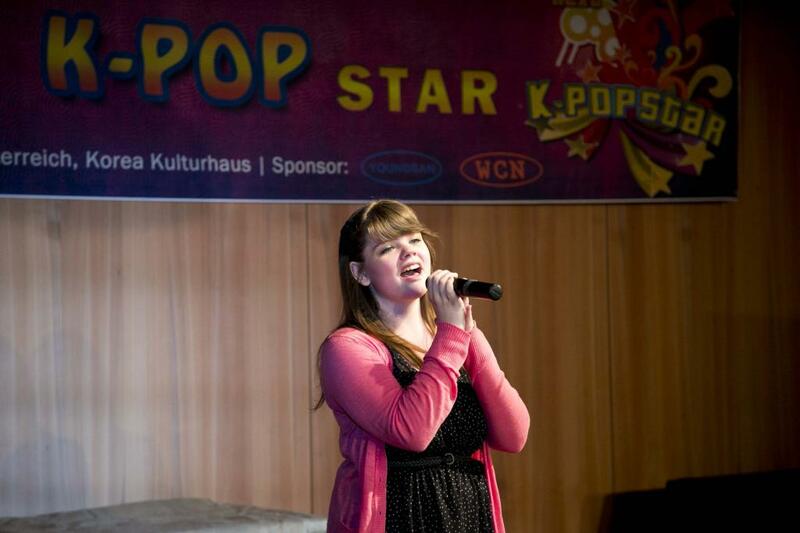 Finally, the last part of my feature of Austria’s Next K-Pop Star is here! With this final article, I will reveal the winner of this great show plus all the amazing prizes, which surely everyone of us would like to have as well! Dancing was the perfect topic for the next performance as we could enjoy another special act. Three girls, who obviously love to dance, decided to open the final round with a powerful show. They danced the choreographies to an amazing number of eleven songs! For those of you who are curious about them, the songs were as followed: EXO – Mama, SHINee – Why so serious?, 4minute – What’s your name?, VIXX – One and on, f(x) – Electic Shock, B.A.P – No Mercy, SNSD – The Boys, INFINITE – Be mine, Rain – Hip song, Wondergirls – Tell me and H.O.T. – Candy. The final round started again with the talented Youngkwang, who was ready to show us his hidden ace card. The young entertainer decided to poker high as he chose the song “To you” of the idol-group TEEN TOP, which came along with a very powerful, yet tiring dance. Not afraid of this challenge, Youngkwang gave his best right from the start, driving the girls in the room crazy. His fans screamed hysterically, showering him with all the love and admiration they had in store. The singer knew exactly how to react, as he used this opportunity to thank his fans with some special fanservice. During his dance performance, he showed the crowd a little bit of his bare skin, which, of course, lead to an almost never-ending screaming-wave. Even though he was able to deliver a very powerful and impressing performance, I have to say that he seemed to have lost his focus on the singing part a little bit. I know that it is really difficult to do both – singing and dancing – at the same time. However, I would have loved to hear his voice more often during his final song. He cut some parts of the song and decided to dance instead, which was indeed great, but somehow it felt slightly strange. This might be due to the fact, that we expected a performance, which has its focus on the talent’s voice rather than the dancing skills. Nevertheless, Youngkwang did a very astonishing job, which earned him huge applause and endless screams of his fangirls. The jury was a bit at variance, as some felt that both, dancing and singing did harmonize, while others thought that he did not give his vocals the needed, or better to say, wished attention. However, they all agreed with the statement that Youngkwang “[is] already a star” and thus, they are very proud of him and his development. Marlies’ final stage differentiated a lot from Youngkwang’s, as she was trying her luck with a much calmer and cuter pop-song. The young singer’s choice fell on BEIGE’s “Can’t Get Through To You”, which suited her very well. I really enjoyed this stage, not because of the genre itself, but because of Marlies’ clear voice, which could be heard without any technical interruptions. She performed absolutely stunning, hitting every note pretty well. The audience was in love with her too, as they began to clap during her performance, signaling her how much they were enjoying everything. It was not surprising that she was showered with loud and long-lasting applause afterwards. She really deserved it! Surprise is a good hint, as the young girl was taken aback right after she finished her stage. The reason was a very cute little boy, who went up to her to give her a little, yet beautiful flower. This was such a sweet surprise, making everyone in the room to squeal like crazy. Marlies was pretty speechless, not sure of what to do next or what to say. However, her face could tell us that she was happy and thankful for everything. I guess there is no doubt that this little boy got all the hearts from everyone present! 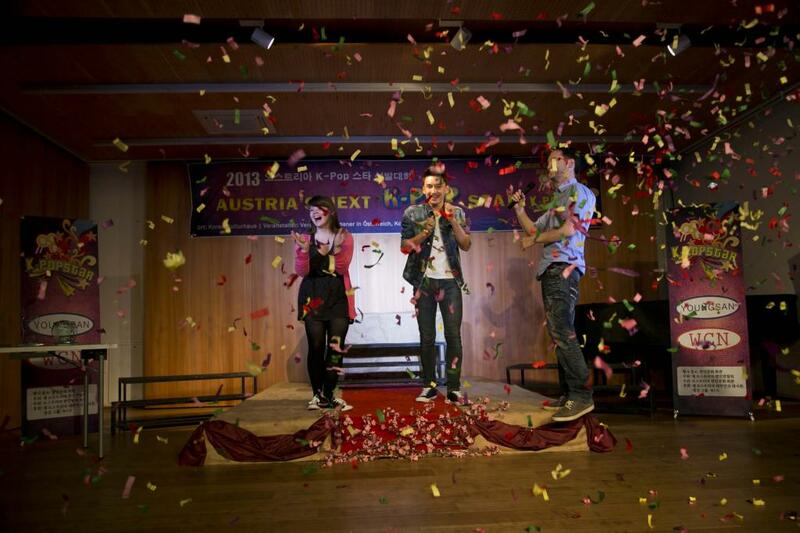 What followed was once again a break for the jury in order to be able to decide who is going to be Austria’s Next K-Pop Star. This time, they did not let us wait for too long, as they came up with an agreement much faster. However, before announcing who was finally able to win this huge pilot-project, Bigi was given the chance to perform her third song. After all, every candidate prepared three songs and it would have been a waste to work hard on a song without ever getting the chance to perform it in front of the audience. Therefore, she went on stage with two of her friends as background dancers in order to sing 15&’s “Somebody”. 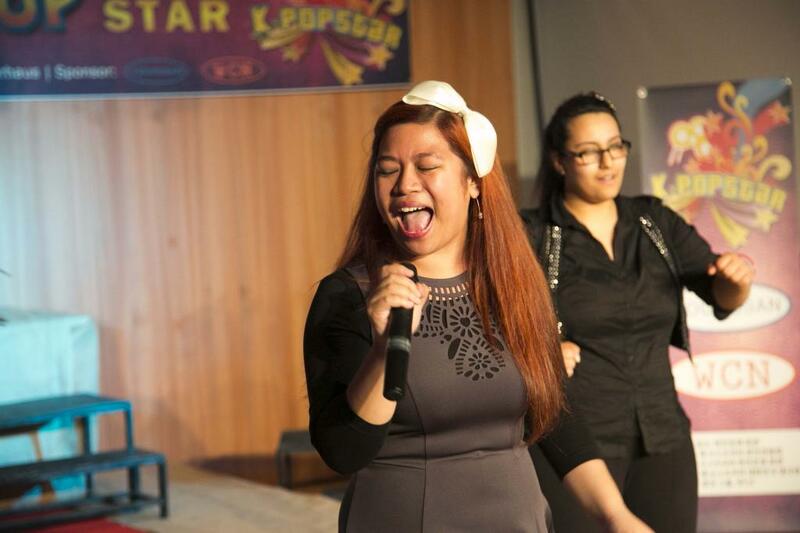 She was visibly enjoying her performance to the fullest, as she couldn’t stop smiling throughout the whole song. The audience loved it too, as they kept on clapping and cheering for her. 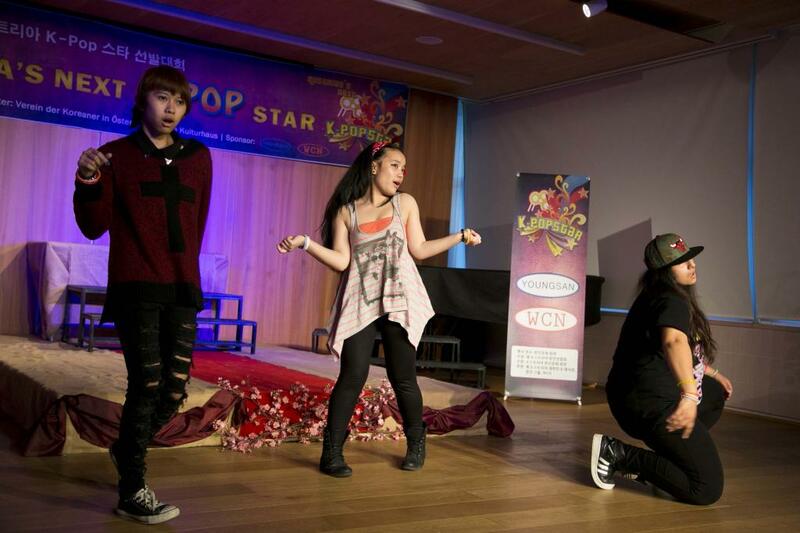 She finished her performance without any problem, thus earning a lot of applause. After Bigi’s stage the MC was about to receive the decision from the jury. However, before he could announce it to the crowd, some of the jury decided to take the microphone for a final speech. They thanked all of the participants for their passion for K-Pop and their engagement as well as determination over the last few weeks and months. Everyone was able to learn a lot from this project, not only the candidates, but the organizers and staff as well. But in particular, the jury was pretty proud of their awesome talents, as without them the whole project would not have been possible at all. Every participant was talented and all of them will make their way for sure. “The final choice between Marlies and Youngkwang was not a decision between just those two, but rather one between two different music genres”, the jury further admitted. With this being said, the microphone was given back to the MC to announce the winner of Austria’s Next K-Pop Star. Excitement filled the room as everyone was starring at the MC, waiting for him to finally say something. And with a bright smile on his face he took the microphone and crowned Youngkwang to Austria’s next and especially first K-Pop Star! Upon hearing this, the crowd went crazy, with his fangirls screaming at the top of their lunges. Youngkwang himself as well as his parents were endless happy, enjoying this special moment as much as possible. No doubt, his parents must be so proud of him! What followed right after was, of course, the award ceremony. Not only the top 3 places, but also 3 former but outstanding candidates were awarded with a special trophy by WCN, one of the show’s main sponsors. 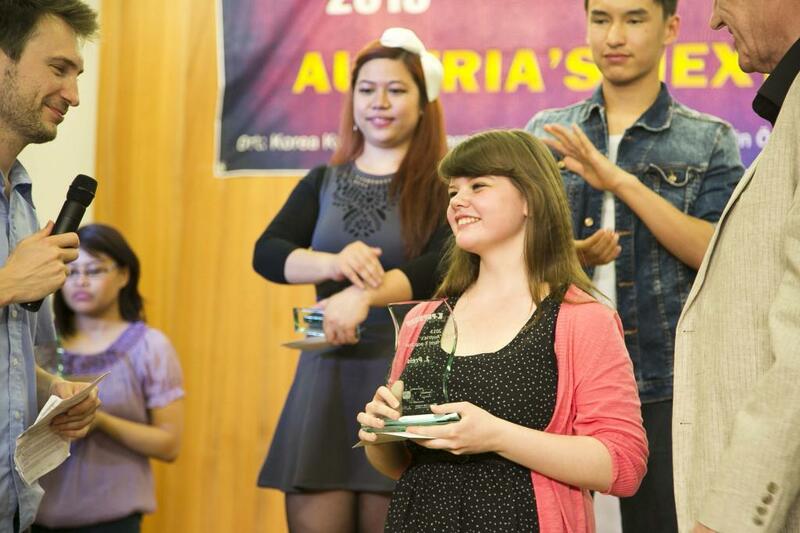 The special awards for an impressing performance came along with a voucher, which amounted to EUR 100,- each and were given to Kang, Dawoon and Chantelle. Bigi got EUR 200,- and a trophy for her 3rd place, while Marlies was awarded with a trophy and a voucher worth EUR 300,- for her 2nd place! Out of all prizes, Youngkwang got indeed the best one. 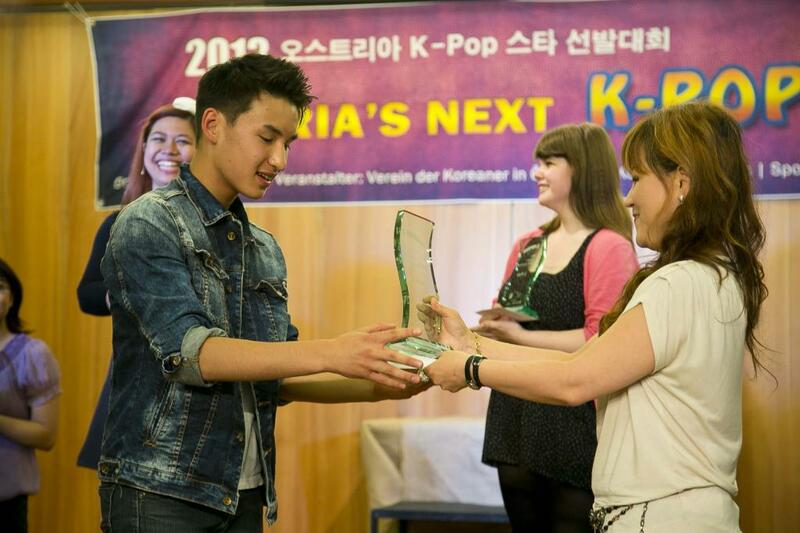 The young entertainer was awarded with a flight round ticket to and from Korea, prize money worth EUR 500,-, some pocket money for his stay in Korea and a trophy for his first place. If you think that this was all he’s got, than I have to tell you that you are wrong. On top of all that mentioned before he received an incredible special prize, which all of us who loves music and especially K-Pop would like to have as well! He is invited to record a Single consisting of two songs together with a songwriter, who claims to have written for SM Entertainment! The audience was pretty surprised with this announcement, as they were all super amazed by what they’ve just heard. We, Kpopeurope.eu, are flabbergasted as well and can only wish Youngkwang all the best for this future projects in Korea! 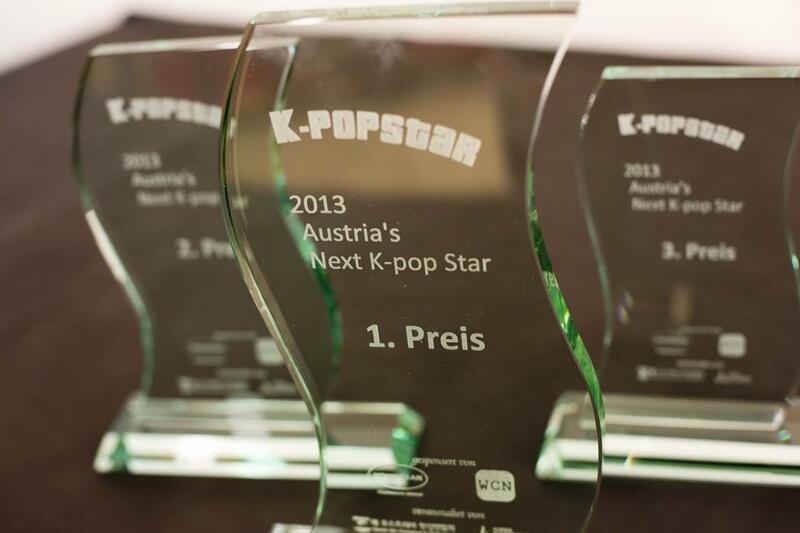 We would be pleased, if we could get some updates from him, as he is Austria’s first K-Pop Star winner and we are therefore more than curious, what the future will have in store for him! 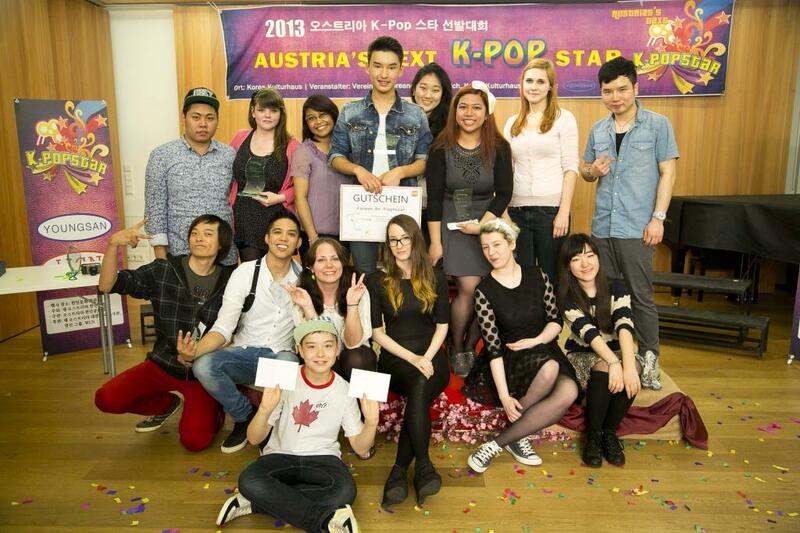 Especially, the recording process with the songwriter and his experiences in Korea would be very interesting; not only for us, but for the organizers of Austria’s Next K-Pop Star as well. The show ended with Youngkwang performing his final song once again, much to the delight of his female fans. As official ending act, another group performance was on the plan, and everyone in the room was invited to join as well. With this Austria’s Next K-Pop Star was able to hold its final show, resulting in a huge success. 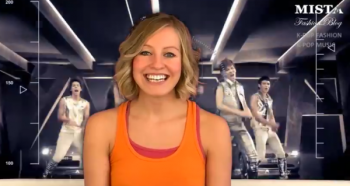 Right after, Kpopeurope.eu took the chance of the moment and tried to get some comments from the show’s TOP 3. Honestly, I did expect Bigi and Marlies to be slightly disappointed, as they were so close to get the grand prize. However, much to my surprise, the girls told me something completely different. Marlies seemed to feel pretty released after the jury’s final decision. This is quite understandable, as a huge stone was lifted from her young shoulders and waiting for something life-changing can be so stressful and tiring. When I asked her for some comments, she eagerly agreed, telling me right away that she “[was] feeling absolutely great, as all the pressure seems to be gone now”. “I am super happy for Youngkwang, as he really deserved it”, she further assured me. 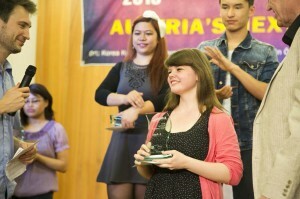 When being asked what she will do with the prize money, she giggled and told me, “I’ll go shopping, of course!” Commenting on the show itself, the young singer said, that she was “thankful for being able to meet such great people.” “I will definitely continue singing as I will try to take some vocal lessons soon”, Marlies concluded. 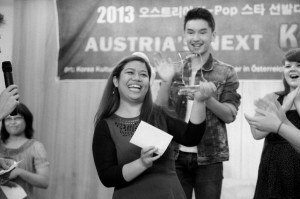 The winner of Austria’s Next K-Pop Star, Youngkwang, was absolutely self-confident when I spoke to him right after the show. “I wasn’t overly nervous as I did not feel any pressure at all. I worked pretty hard for every stage, giving my best for the whole preparation and show. Therefore, I could stand there confidently, not feeling any heavy burden at all”, so the young talent. Asked about his future plans he said, “I would like to continue my training at DEF Dance School in Korea and learn more about rapping, dancing and singing. I was there last year for two months and I absolutely enjoyed it!” Regarding the special prize he has got, he told me that he is eagerly looking forward to it as it would be a completely new and absolutely amazing experience to record an own single. 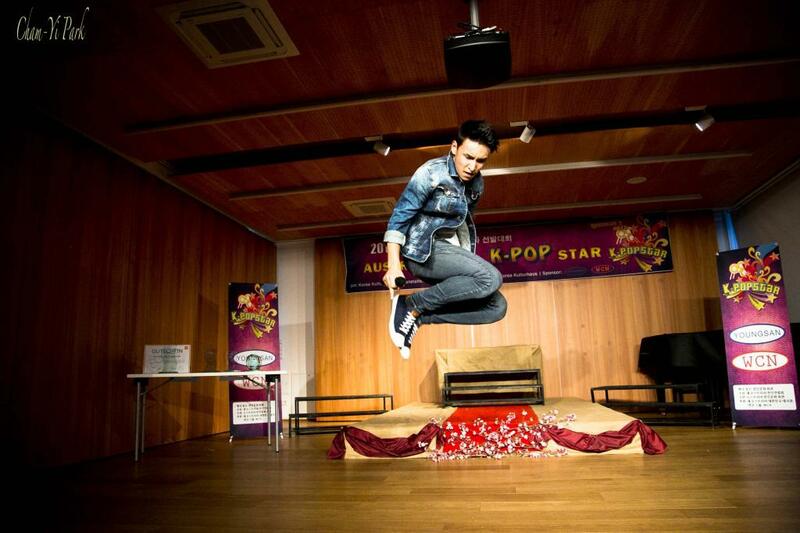 At this point, the whole team of Kpopeurope.eu wants to congratulate Youngkwang and the winners of the second and third place as well. So, congratulations and all the best to Youngkwang, Marlies and Bigi!! You guys were awesome in every performance you showed us!! Also, congratulations to all organizers, staff members and sponsors for creating something impressive like this! For everyone who wanted to participate in the event but was not able to do so, we have some great news for you! 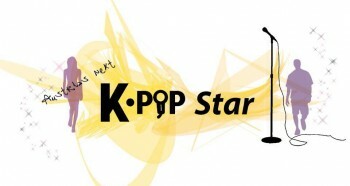 Kpopeurope.eu was told that this pilot-project will continue next year, yet on a more professional level. So take your notes and start practicing soon enough and who knows, maybe it is YOU who is going to Korea next summer! Like last time, I tried to interview some people from the audience regarding their comments and opinions on Austria’s Next K-Pop Star! So here is what I’ve got! Were you present at the final too? If yes, did you enjoy it?! Tell us your opinion below! One a side note, please show some support to ANKPS, all the amazing contestants and to Kpopeurope.eu’s writers by commenting below. 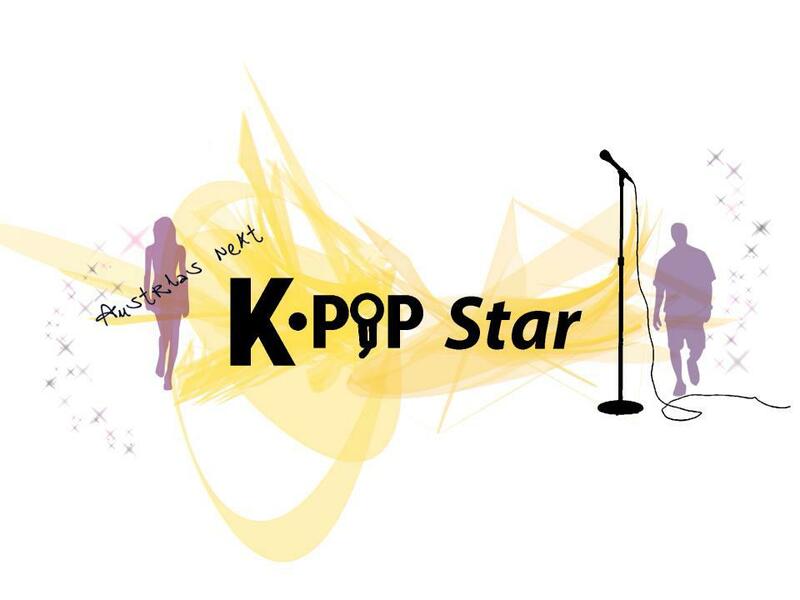 We would love to hear our readers’ opinions in order to being able to not only develop our K-Pop projects in Austria and Europe, but also Kpopeurope.eu itself! Thank you for your continuous support! Note: Should there be any spelling error of any names, please let me know in the comment section below! Here is the Event-Page on Facebook! So once again, thanks a lot! I really appreciate it!